It would be impossible to get starved in Hanoi - the centre of sensational cuisine. No matter where you come from, an array of restaurants providing foreign fares and Vietnamese cuisines are always ready to serve all your needs. 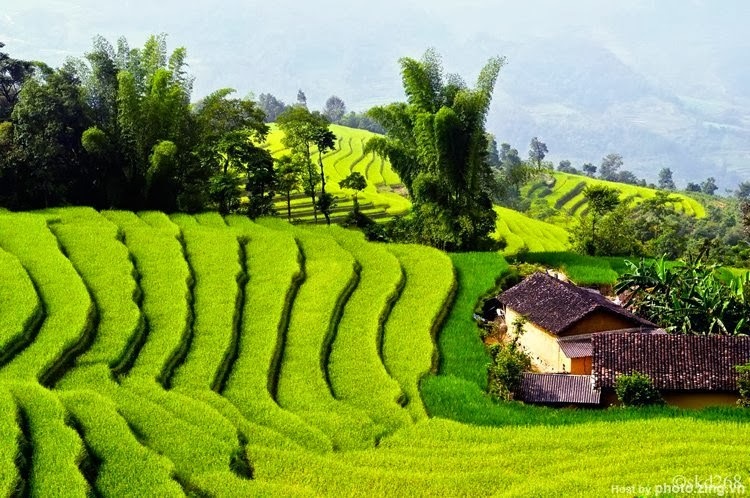 Even vegans also find Vietnam an ideal destination for an appetizing vegan meal. 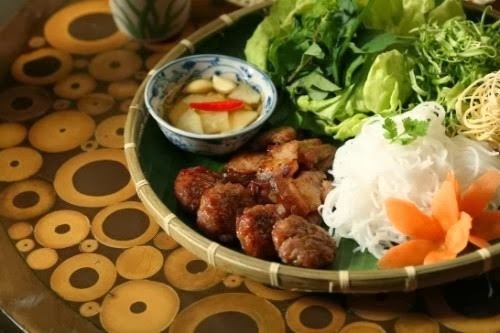 It is not hard to find a high end Vietnamese and foreign restaurants that could offer you either local specialties or cuisines of your home country either. 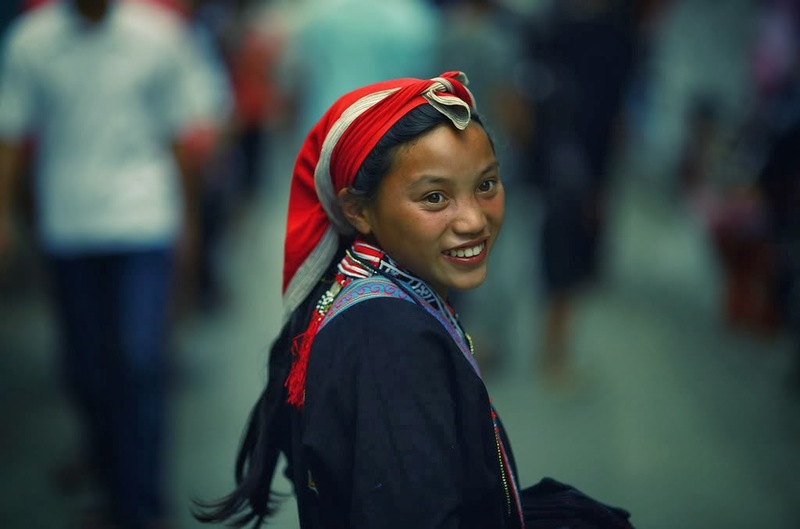 But perhaps, as part of the adventure, why don’t you enjoy authentic Vietnamese fares as the way the local does, trying squat stool places at street side and humble restaurants in narrow alleys? This is the best way to belly up to real local cuisine and enjoy your trip the most. 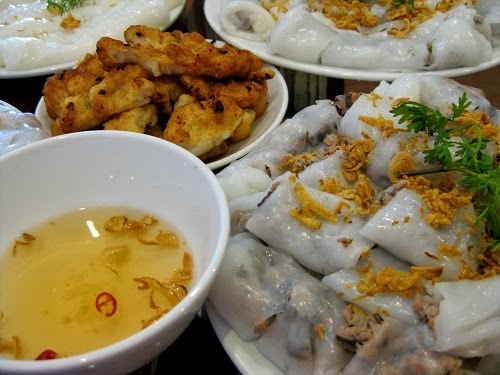 Plus, nowhere in Vietnam could you easily savor delicious cuisine from three main regions of Vietnam as Hanoi and nowhere in Hanoi could you easily find a decent restaurant as the Old quarter. Get lost and find your own local favourite, and do not forget to share with me too. Luckily, the address is right there in the name (fairly common in Hanoi, thankfully). The place is full of scooters at lunchtime, and they even valet-park your two-wheeler if needed! The tree in front studded with nails and hung with keys is a good way to check that you're in the right place. An order of fried crab spring rolls (nem cua bể) are a traditional accompaniment that you can take or leave. We take. 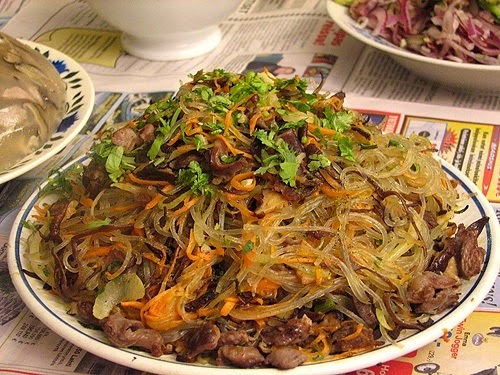 To eat, grab some noodles and herbs and mix them into your fish sauce pork. Add pickled garlic or chiles, if you'd like. Eat. Add more herbs and noodles. Eat. Et cetera. Fun and interactive, with each bite being a different combination of crunchy, funky, herby, spicy, meaty, and crisp. Bún Chả 34 Hàng Than, 34 Hàng Than, Hoàn Kiếm, Hanoi. 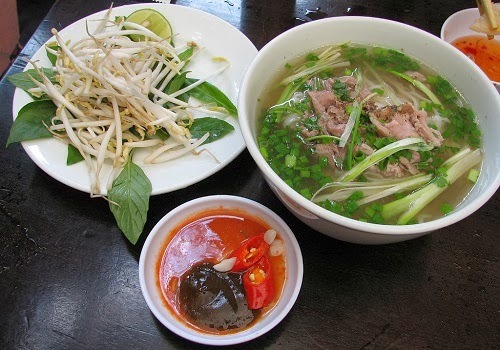 Hanoi Phở is very different from that of Saigon. It's lower on the veggies, and the broth isn't generally as heavy on the sweet spices. Basically, I didn't think I was going to like it very much. Phở Gia Truyền (which seems to mean "old-style Phở") proved me wrong. Small menu, usually a great sign in places like this. Your choices: Beef soup. Rare flank steak (tai nam). Rare steak (tai). Or well-done steak (think brisket - chin). Add a chicken egg, trung ga, if you want. Yes, again, we want. Also, they had the pot of broth going over these coals when we walked in. And the Phở? Delicious. Perfect ratio of broth to noodles to meat. I love a good stocky soup in the morning. Kick it up with some chilies to get a good healthy sweat going, perfect if you may have overimbibed the night before. 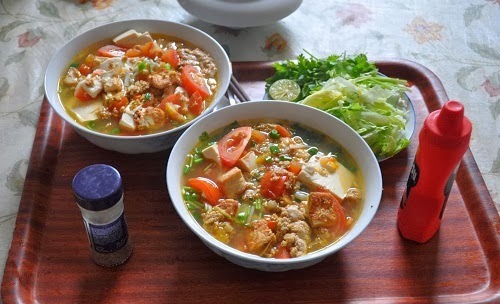 Phở Gia Truyền is on 49 Bat Dan St, Hoàn Kiếm, Hanoi. Careful, as this is an early in the day dish; they can sell out by noon. Bánh cuốn are one of my favorite Vietnamese dishes. They're free-form dumplings, or tiny rolls, made with fresh rice paper stuffed with a ground pork and mushroom mix. Each tapas-size sharing plate comes topped with dried shallots and fresh sprigs of cilantro, and you can (and should) order some meats on the side to add texture. We chose a small plate of Chinese sausage and shrimp cake. Bánh cuốn gia truyền does these beautifully. The rice paper is perfectly formed and perfectly fresh, just strong enough to hold the fillings together while being soft enough to offer your teeth very little resistance. Their nước chấm, or fish sauce dip, is one of the best we tasted in our three weeks in Vietnam; perfumed with ca cuongextract (I'll go into that more later) and with just the right amount of citrus. We went for dinner, but I'm pretty sure they're open for lunch as well. Bánh cuốn gia truyền is at 14 Hàng Gà, Hoan Kiem District, Hanoi. Lươn means eel in Vietnamese, and that's what you'll get here - teeny fried eels served in a variety of ways, from soups to porridges to atop glass noodles. The menu is short and sweet, like many of the places we enjoyed in Hanoi. Logan and I both ordered the Miến xào lươn, on Gastronomer's brilliant recommendation. This is glass noodles, topped with fried tiny eels, bean sprouts, and egg, garnished with those savory fried/dried shallots, fresh cucumber, and purple shiso. It also came with a side bowl of rich, thick broth. Nice and eel-crunchy and fresh and herby and soft with noodles - and of course with lots of side sauces and fruits to customize your dish! Nhà Hàng Miến Lươn is at 87 Hàng Điếu, Hoàn Kiếm, Hanoi. 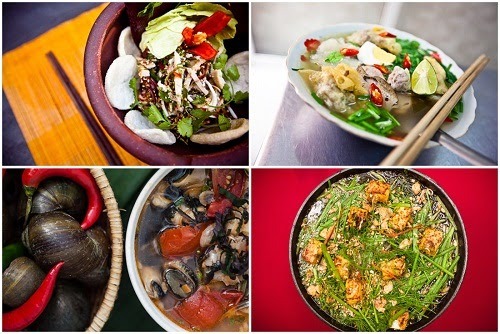 These slightly sour/sweet/spicy, crab or snail soups are very popular on the streets of Hanoi. They make a good breakfast, full of revitalizing liquid and just enough protein to start your day off right. I just didn't care too much for the version we had. Too much fishy crab pastey, not enough sour spicy - the balance seemed a bit off to me. But it's worth a try at one of the many places that line the streets. Please let us know if you find a version you really like! We had our bun oc and bun rieu at 34 Cầu Gỗ, Hoàn Kiếm District. Xôi is a super simple dish - it's meats of your choice on a bed of sticky rice. 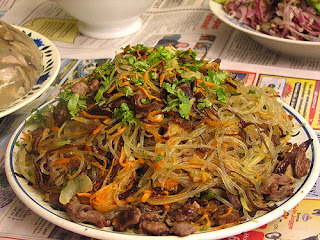 I liked the Xoi Xeo, which is topped with mung bean paste and dried shallots as well as meat. Simple, cheap, and filling, and while we were there a mobile karaoke dude set up in front, adding just that little extra touch of special. 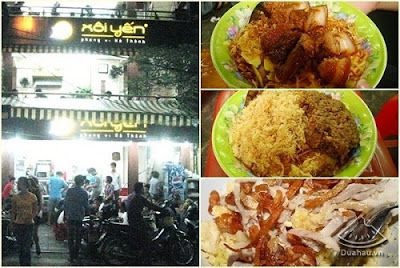 Xôi Yến is at 35B Nguyen Huu Huan, Hoàn Kiếm, Hanoi.